In the interests of not wanting to make it look like the cockpit of a spaceship when new users first open the SpeedQuizzing host software, it is important that we don’t just keep throwing new features and controls at the interface. On the other hand however it is equally important that experienced hosts are offered evolving functionality to keep their regular quiz nights fresh for their recurring teams. Our solution is to incorporate advanced features to enhance functionality but to keep them hidden from the novice user. Generally holding shift will reveal the hidden feature. If a hidden feature proves to be popular then it may become un-hidden in a future version of the software. Holding down shift when on the Keypad Round Settings page display’s an extra option to extend the Speed Bonus to also award bonus points to the second fastest correct answer and third fastest etc on a sliding scale. Set Speed bonus to a number larger than 1 (for example 3) then whilst holding down the shift key on your computer keyboard, enable Sliding scale by ticking the box. This will enable the fastest correct answer to get 3 bonus points as usual, but now with Sliding scale enabled, the next fastest team to answer correctly will also get 2 bonus points and the third fastest 1 bonus point. 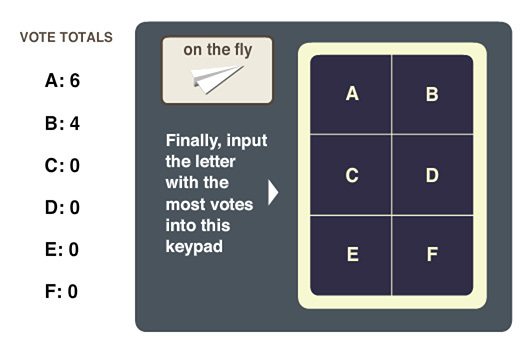 A voting question can be a lot of fun and work’s well when inserted occasionally into an existing keypad round or done as a short stand-alone keypad round. The premise is simple. Teams answer a question to which there is no wrong or right answer aiming to be in the majority to win points. EG. Who were the best group. A. The Beatles B. Abba? If six teams answer The Beatles and 4 teams say Abba then the six teams who said The Beatles become correct and get the points. (If it should end up being a tie such as The Beatles and Abba both receive 5 votes each, then the host (you)should have the casting vote). When you are about to select a Multiple choice question in an On The Fly or inserted/replaced question, holding down Shift will now display a new option entitled Voting Question. Hold down shift and select Voting Question (pictured above). Read out these rules…. “I will read out a Multiple choice question. Then at the end of the 10 second countdown the most popular answer will become the correct answer. In the unlikely event of a tie then I (the host) shall cast the deciding vote. Optional Extra info. Go Wide and Evil mode will be disabled for the duration of this question so all teams should submit an answer”. Now ask an opinion type question and start the 10 second countdown. EG ”What make the best pets A. Cats B. Dogs“? All ten teams input their answer before the end of the countdown and your screen look’s like this. As you can see on the left, the most popular answer was “A”. If it had been a tie you (the host) would need to provide the casting vote. Now you simply press A on the virtual Multiple choice keypad to confirm that “A” was the most popular answer, and then announce. “The correct answer based on public opinion with 6 votes is….. A. Dogs” whilst pressing the blue button as usual. And then announce fastest team for the bonus points…… etc etc……..”. The Silent End Question feature is very simple. It serves a very basic function which is to mute the sound of the 10 second countdown during a Keypad question. Some hosts have expressed that in addition to the Clips Round there are instances where they prefer to incorporate an audio clip such as a piece of music or mystery voice into a Keypad question by playing it from iTunes or DJ software. The Silent End Question simply allows hosts to play music right up to the end of the ten second countdown without the sound of the audio clashing with that of the 10 second countdown. This is an example of one way in which it could be used. Have a song pre-prepared in iTunes, for instance Beyonce Crazy in love. Set up an On The Fly Letters Question in the host software. Announce “I’m going to play approximately 15 seconds of a piece of music in which time you must input the first letter of the name of the song”. Click it whilst holding shift and the countdown will do it’s thing for the ten remaining seconds but wont make any noise allowing the song to play in iTunes until the 10 seconds is up. You might want to warn people verbally when they have 5 seconds left. Then it is just a case of stopping playing the song when the silent timer ends and marking the On The Fly Question with a “C” for Crazy in love. 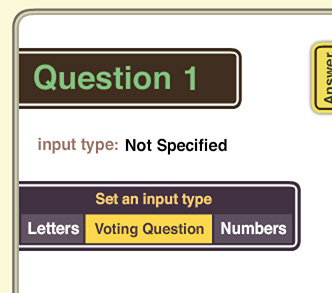 Note: If you prefer preparing your questions in advance in the SpeedQuizzing Question Manager, the Silent End Question button will also work on your own Quizpacks. Fast Tracking is the most radical of the hidden features. Fast Tracking is not for the faint hearted. It is for hosts who want to shake things up in the keypad rounds. Fast Tracking work’s best when you have 6 or more teams but can work with less. 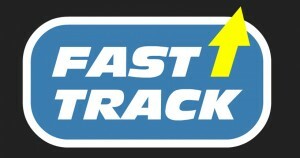 Fast tracking is designed for those hosts who want to give teams on the lower end of the leader board the chance to occasionally jump into 1st place. It may upset some of the cleverer teams initially, but the weaker teams love it. It is a cool solution for situations where the same teams are winning every week. Most of the time the cleverer teams will still win but the lesser teams have more fun knowing they are still in with a chance right up until the end of the games. Fast tracking doesn’t need to be enabled. Just announce the rules at the beginning of a keypad round. “At the end of the 10 second countdown, if the top three teams on the leader board have all failed to answer correctly but your team have got it right faster than everyone else, then rather than receive a speed bonus….. you will be Fast Tracked into 1st place.” !!!!!!!! Then at the end of each question, after announcing the correct answer and pressing the blue button, you need to manually check the top three teams on the team list. On the rare occasion that none of the top three teams have answered correctly but at least one team from below has answered correctly, then you announce that “There has been a Fast Track into first place”. Everybody gasps, then in place of announcing “For the fastest correct answer the bonus point goes to….” you announce “For the fastest correct answer, Fast tracked into first place its…..” then before hitting the blue button to reveal the fastest team, hold down shift to reveal the Fast Track Icon. On pressing the Fast Track icon, rather than awarding a speed bonus point or points it will catapult the fastest correct team into first place by one point.